Fillers | CMI Marketing Sdn. Bhd. 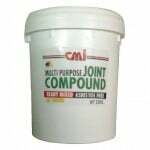 CMI JOINT COMPOUND JC 3000 is a polymer based ready mixed compound that provides a smooth high quality finishing for gypsum board panel joints. It is used by professionals for embedding reinforcing joints tapes, finishing gypsum board panel joints, plastic corner beads and nail heads. It can also be used as a general purpose crack filler or texture decorative coating.